PITTSBURGH, PA., DECEMBER 19, 2017— A 24-year-old father who attempted to save his 3-year-old son from a burning building, a 76-year-old who removed a man from a burning car, a teacher, an arborist, and two high school students are among the 20 men and women recently awarded the Carnegie Medal for outstanding civilian heroism. Seven individuals were honored posthumously in this class of Carnegie Heroes, including three who were attempting to rescue children. The Carnegie Medal is given throughout the United States and Canada to those who risk their lives to an extraordinary degree while saving or attempting to save the lives of others. The heroes announced today bring to 77 the number of awards made to date in 2017 and to 9,991 the total number since the Pittsburgh-based Fund’s inception in 1904. Commission Chair Mark Laskow said each of the awardees or their survivors will also receive a financial grant. Throughout the 113 years since the Fund was established by industrialist-philanthropist Andrew Carnegie, $39.6 million has been given in one-time grants, scholarship aid, death benefits, and continuing assistance. Jason Allen Williams Orange City, Fla.
Courtney Baynes Dorsey, deceased Georgetown, S.C.
Demetrius T. Johnson, Sr., deceased Buffalo, N.Y.
Terryann E. Thomas Topeka, Kan.
Austin Craig Welch, deceased Bartow, Fla.
Davis Ilan Zinsenheim, deceased Marietta, Ga.
Thomas M. Petruszak, deceased Manteno, Ill.
Noah Hill King Panama City, Fla.
James Edward Giles Terrace, B.C. Joshua J. Owen Kansas City, Mo. Kyle Van Note Kunkletown, Pa.
James Raymond Garvey, Sr. Fairhope, Pa.
Angel Darlene Fiorini Newman Lake, Wash.
Matthew Paul Burson Spokane Valley, Wash.
Justin William Schroepfer, deceased Rhinelander, Wis.
Dmitriy A. Bondarenko, deceased Shakopee, Minn.
To nominate someone for the Carnegie Medal, complete a nomination form online, write the Carnegie Hero Fund Commission at 436 Seventh Ave., Suite 1101, Pittsburgh, PA 15219, or call 1-800-447-8900 (toll-free). 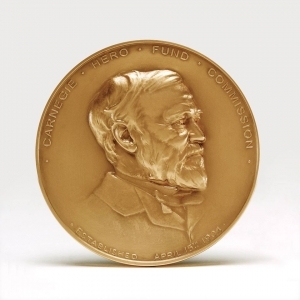 More information on the Carnegie Medal and the history of the Carnegie Hero Fund Commission can be found at carnegiehero.org. Find us on Facebook or Twitter.